Pieces include a train, bridge, tracks, traffic sign, church, trees, people figures and more! Inspired by classic toys and designed with a modern twist, the Squirrel Play 35-Piece Wooden Train Set comes with loads of pieces for storytelling fun. 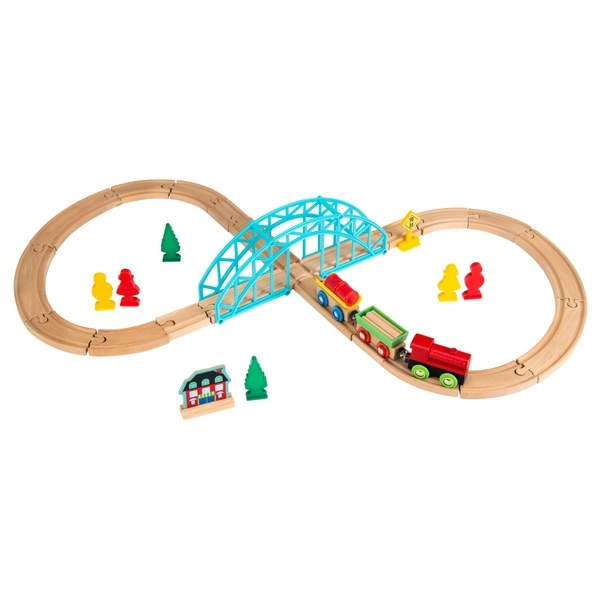 The curved wooden track pieces are easy for little ones to fit together, building a figure-of-8 track with a big blue bridge (and building fine motor skills too!) The Squirrel Play 35-Piece Wooden Train Set comes with 4 colourful figures and a 2-car engine for little ones to pull along the track. 2 wooden tree pieces, a sign and a building set the scene for any story you can imagine. This wooden train set is smooth, well sanded and non-toxic. The durable wood construction is designed to last, making it a wonderful gift that can stay in the family for years to come. Each Squirrel Play toy is designed with care and crafted with love. The belief that playing with natural materials helps to keep children in touch with the world around them is central to the design of these beautiful wooden toys. The right toy can spark a world of imagiation—because no one is more creative than a child at play. The Squirrel Play 35-Piece Wooden Train Set helps to grow curiosity and motor skills while inspiring creative play. But the real goal is to make kids smile. For hours of fun, just add imagination.